In honor of all those who serve and sacrifice, here’s a condensed version of one veteran’s tale. 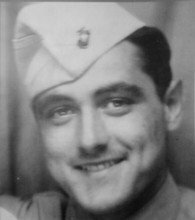 Lewis Eugene (Gene) Curtis served in the United States Marine Corps from 1943 (at age 16) until 1946. I chose the Marines. Mother worked for the Army, in the Pentagon. She worked for Dwight Eisenhower, who was a Major at that time. I wanted to be away from my mother, so I went into the Marines. I was 16. I tried to join in Washington, D.C., but they kicked me out because of my age. So I went to the recruiter in Alexandria, Virginia, and they marked me as undesirable because of my age. So I went back with my mother’s signature and joined with the stipulation that I report in Phoenix, then San Diego for boot camp. That finally worked. I became a marine in 1943. I was a buck private. And buck privates get 30 days of mess duty. I didn’t like it. I told the old sergeant what I thought about it. He said I needed an attitude adjustment and gave me 30 days more. At the end of 60 days, I liked it. And I knew how to answer him. But that made me late for tank school. When I got there, they asked where I’d been and I told the sergeant I’d had mess duty for two months. Because I was late, I had to wait for a spot to open and he gave me another 30 days of mess duty. Here I was with almost six months in the Marine Corps and all I knew how to do was peel potatoes! I did well in tank school and they sent me to other schools to learn to repair tanks. I had a 736 spec number, which was a real specialty. If a decision had to be made whether to repair or blow up a tank, I could make that decision. Then I got on a ship to Honolulu, then on another ship and joined the 2nd Marine Division, wherever they were in the South Pacific. I joined them on their ship and we went to Saipan, where I was taught Japanese. Then our ship went to Okinawa, then Japan. In Japan, I was assigned to military government. That meant that every day I would negotiate with the Japanese in English through an interpreter. I wasn’t supposed to reveal that I knew their language. I was exposed to radiation at Hiroshima and Nagasaki. When that hit me, it hit us all, we just collapsed and woke up days later in the hospital. I was sent back to the states and spent a lot of time in the hospital. Nobody knew we would get sick. We were at sea when they dropped the bombs. I remember they announced over the intercom that it looked like the Japanese were going to surrender. About a day later we pulled into Nagasaki Bay. That was a terrible thing. There were bodies floating in the water. Everything was destroyed. The buildings were still burning. I picked up a little baby that had its arm blown off and held it. That baby never cried. I held it and it died. When we walked onshore from Nagasaki Bay about a day after the bombs were dropped, I think we were totally dazed by what we saw and just walked around for a while. Then we got organized for our mission to the POW camp. When we got to Fukuoka, there were no guards. Not a Japanese in sight. We shot the lock off the gate. Those men were in little cages, like you’d keep a dog in. They couldn’t stretch out. They thought we were Germans because of our helmets. They were afraid of us. We finally got some of them convinced we were Americans. Those poor men were in such poor shape that most of them didn’t even know what we were talking about. We tried to feed them; they couldn’t eat our food. Some couldn’t come out of their cages. We pulled them out and they couldn’t stand up. We took blankets and poles and made a stretcher and carried them. It was about 18 or 20 miles, I think, back to Nagasaki Bay. There were two hospital ships there: the U.S.S. Mercy and U.S.S. Comfort. Getting home from the Pacific in 1945 was a miracle. I was pretty out of it from radiation sickness. I came back from the hospital in Japan and don’t remember a thing. I was unconscious the entire trip except I came to when we were refueling in Alaska. I told the nurse that Alaska was where my Dad was buried. She let me look out a porthole while we were docked. Next thing I knew I was in the Santa Margarita Naval Hospital in San Diego, California. I had periods where I was just totally unconscious, sometimes for days or weeks. That went on for years. I had relapses for quite a while… when I was in college, even once when I was driving a tanker. I usually didn’t tell anyone. But I was in VA hospitals several times. I’d black out somewhere and wake up in a hospital days later. I finally forfeited all my VA benefits to get out of the hospital. I was twenty years old and scared I would end up in the hospital the rest of my life. I felt that way because my roommate in that hospital was a Civil War veteran. He was 102 years old. And he’d been there since the Civil War! I could just see that being me! I wanted out of there… Even 30 years later, I had another episode and ended up in the hospital in Wyoming, but I never told them I had been in the service or that it was caused by radiation. That would have just meant more tests. I was involved in combat multiple times in the Pacific islands, but I wasn’t smart enough to be scared. A storm scared me more than guns. I was in the Pacific, going into Okinawa, when a big storm hit. On the ship there was a rope ladder going over the side- a Jacob’s Ladder. That typhoon had hit. It was just blowing everything. I went overboard into the water. I saw the bottom of the ship underwater, then I came back up. I grabbed that ladder! I bet it took 10 men to get me to let go of that ladder! I was scared. That was the most scared I ever was. That was worse than combat. But rockets scared me, too. When I first saw rockets, they were behind us, and I just knew we were all dead. I was never so scared in my life. I was in a foxhole and I bet I dug it four feet deeper! That was on Saipan. But other than that, I was too young to get scared. The guys that were older, that had families, they had a lot at home to be scared about. I didn’t have a thing at home. I wasn’t old enough to have brains enough to be scared. But tragedy never bothered me after that. After that, everything I saw in my career with the highway patrol was no big deal. Gene went on to have a distinguished career in law enforcement. He will turn 90 this July and I am proud to call him friend. How grateful I am for him and for all the brave men and women who defend our freedoms! Do you have a loved one who served (or is serving) in the military? Make sure you capture their tales! For free veteran-specific writing prompts, see this post.